Located in south central Georgia, the Valdosta Regional Airport opened in 1940, but was taken over by the military in 1941. It served as an auxiliary air field to Moody Army Airfield, to provide twin-engine pilot training. Seventy years later, the airport is still visited by Moody flight crews on training flights. This is a relatively quiet airport, on 760 acres, near a freeway. It has 53 total based aircraft, including 36 single engine, 15 multi-engine props, and two jets. The only commercial service is three flights daily feeding Delta at Atlanta. The airport had an FAA-funded control tower until 2009. The airport has since entered a unique arrangement for providing ATC services. Essentially, a company with retired controllers offers an intensive one-year ATC school. The contractor uses simulators and on-the-job training, handling the VLD air traffic, and produces proficient controllers in one-year programs. The airport is not charged for the ATC services. …FAA recently announced that it will close 173 air traffic control towers on April 7, and 16 more at the end of the fiscal year due to the sequester, but the Valdosta Regional Airport is not in danger. “(Our tower) does not receive any federal funding,” said Valdosta Regional Airport Director and Manager Jim Galloway. The air traffic controllers are employed by Advanced Air Traffic Control, “…a private company that operates the tower for us.” Advanced ATC has a partnership with Wiregrass Georgia Technical College. Advanced ATC conducts ground and simulator training at Wiregrass for no cost while Wiregrass students who are seeking their air traffic control certificate conduct live traffic for free for Advanced ATC. Galloway noted that there are certified controllers in the tower at all times and that all controllers are FAA certified. “A private tower is not the norm,” said Galloway. …Runway 17/35 was extended, making Valdosta the airport with the third longest runway in Georgia. …A local news article about an ongoing lawsuit. The airport neighbor to the northwest had planned to develop some commercial property, but the airport’s Runway Protection Zone (RPZ) blocks his right to build to the 50′ height he had planned. 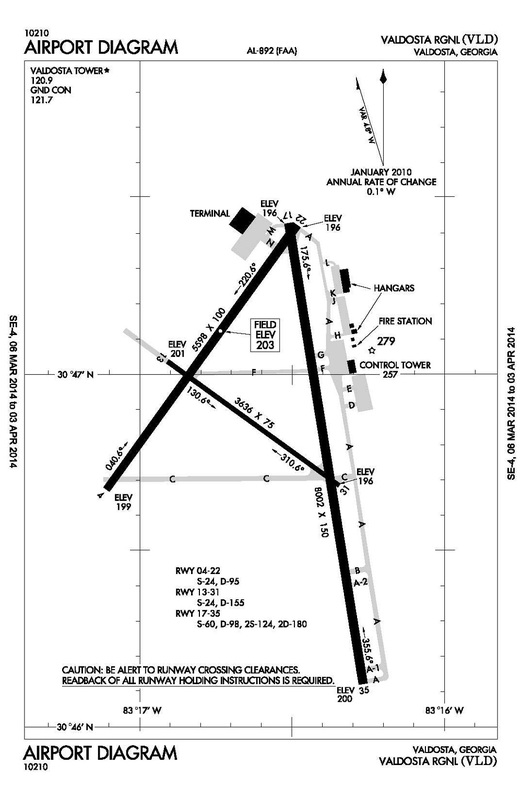 The problem is Runway 13/31, which is the shortest runway, at only 3,600′ long. Some would like to see that runway closed outright, to open up more land for commerce. …Information about the company that trains new controllers at Valdosta.